INDIANAPOLIS, Ind.— With our hotel less than a mile away, we decided to walk to the Indiana State Capitol this morning to avoid any possibility of parking problems since the legislature is in session. After taking a few photos outside, we approached the main entrance of the building. When we entered, a lone guard was staffing the security checkpoint. He was so reticent we were left guessing what to do as he busied himself unstacking what appeared to be large pet water bowls designated for transporting small personal items through the x-ray machine. Finally he mumbled that I should remove my jacket so the zipper wouldn't set off the metal detector. A nod was the only direction we received to walk through the detector. Not another word was spoken as we retrieved our belongings from the x-ray machine and walked into the building. 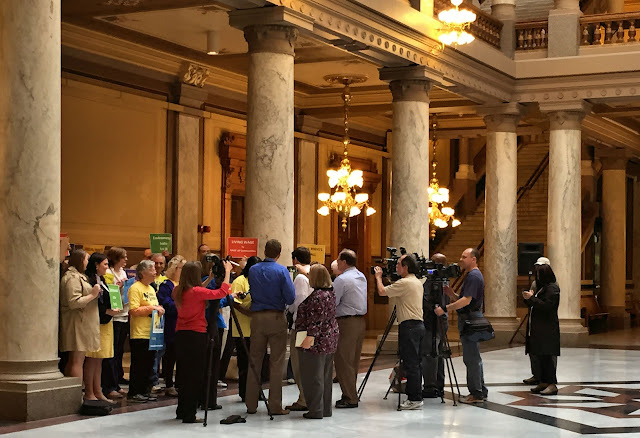 With the legislative session hurtling to a frantic conclusion this Wednesday of what the entire nation knows has been a controversial session, the statehouse was a very busy place. General meetings weren't scheduled until afternoon, according to signage, but the building was a hive of activity. The rotunda and both the north and south atria were decked out with rows of black plastic chairs in obvious preparation for various groups expected to visit today. This cheap institutional furniture definitely detracted from the first impression of the capitol building. Looking up, however, we were quite impressed with the 72-ft. stained octagonal glass dome. 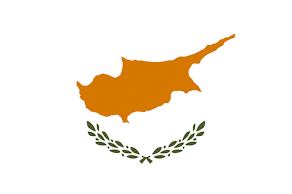 Though it is lovely, we were unable to discern any symbolic significance to the pattern. Making our way to the tour desk about 10:00, we were told that we could join a group of school students at 10:30 for a 90-minute tour (twice the standard length) or we could come back "another time." None of the the four employees on duty at the visitor desk showed any interest in us visitors except one, who took the role of spokesperson. He told us repeatedly, "You're more than happy [sic] to join the school tour" and "You're more than happy [sic] to come back later." He was wrong on both counts. We were not happy, let alone more than, to do either. When we asked curiously about all the chairs set up 60 feet from their desk, they let us know quickly that it was not their job to keep up with such. 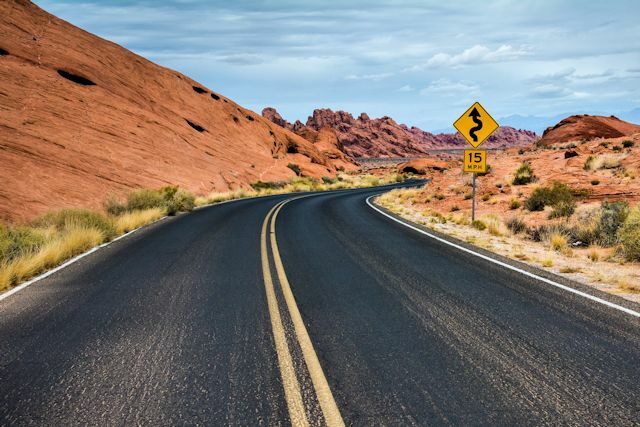 At that point we could tell that they had devoted far more time and attention to us than they felt we merited. Somehow, though, we were able to secure a self-guided tour brochure before we were summarily dismissed. To be precise, they didn't actually hand us the document, but they were kind enough to point begrudgingly in the general direction (within their reach) of where the documents were on display. We left the tour desk chastised and thoroughly put in our place. 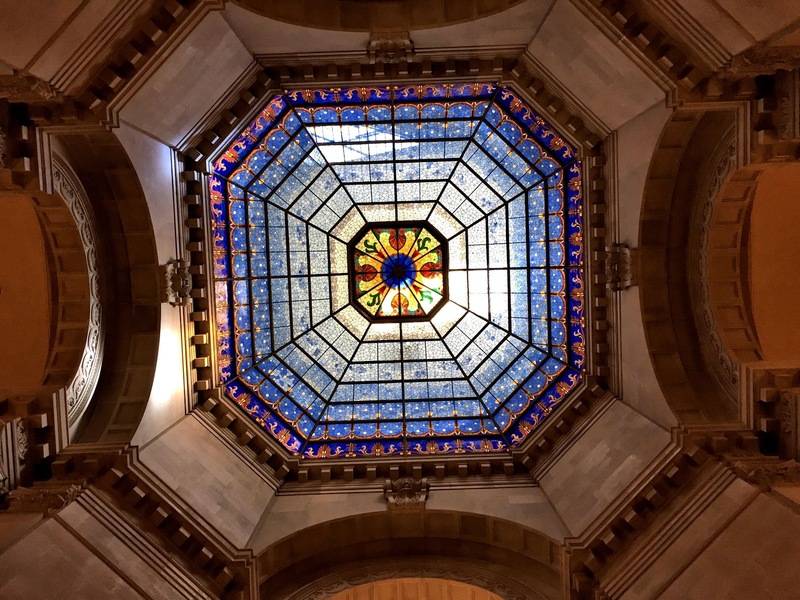 Visitors to the Indiana statehouse were on their own and not particularly welcome. 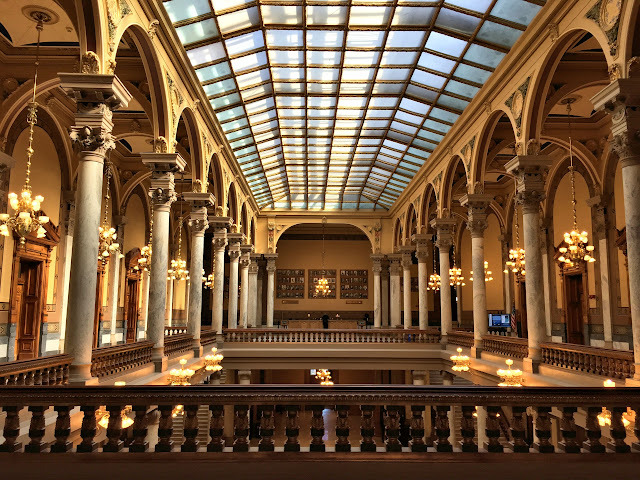 What a contrast to the warm reception we received in Louisiana, Illinois and Iowa—just on this trip—and most of the other statehouses we have visited. 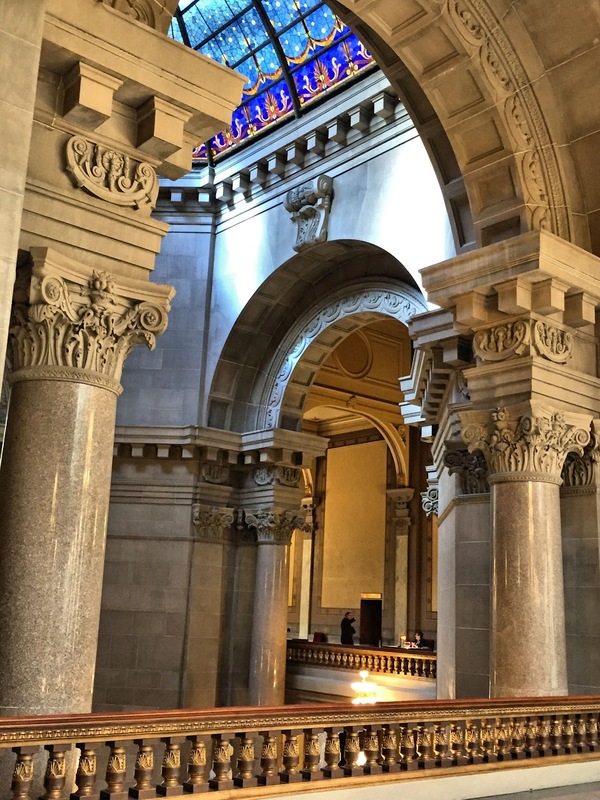 Our typical experience is friendly employees and locals who appear genuinely pleased that we have taken enough interest to visit their state capitol. And yet, we pressed on. With the brochure we wrangled from the self-important visitor desk employees, we wandered around the second floor—the main entry, which housed a number of executive department offices including the very ornate "Office of the First Lady." As we explored the building, taking photos and consulting our brochure, not one person made any attempt to engage with us, nor did they respond to our overtures. In fact, the dozens of legislators, lobbyists, and state employees we encountered all seemed to regard us with suspicion. We had no idea why. When we climbed the stairs to the fourth floor, the icy atmosphere melted a bit. At the security station outside the Court of Appeals, we were warmly greeted the moment we cleared the top step. "Finally!" I exclaimed, "we found a friendly Indianan." We told the amiable guard about the frigid reception we had received at lower floors. He was quite apologetic and in a clear effort to reverse our impression, he thoroughly explained everything that was on the fourth floor, encouraging us to be sure to visit the House and Senate galleries, even though our brochure warned that no one could enter those hallowed halls without a guide. Still a bit unsure when we reached the door to the Senate gallery, we asked Carol, the gatekeeper seated at a nearby desk, if we could enter. "Sure!" she exclaimed. "Just turn the knob on the right hand door." 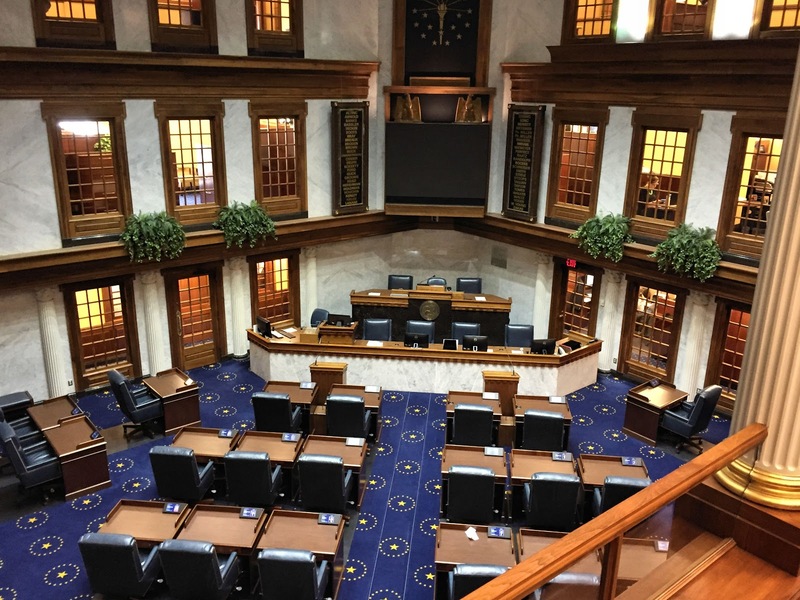 When we entered, we beheld a very compact Senate chamber—for only 50 senators—with an almost spartan decor. The carpet featured a star pattern—one large star encircled by 19 other stars to represent Indiana's entry into the Union as the 19th state. 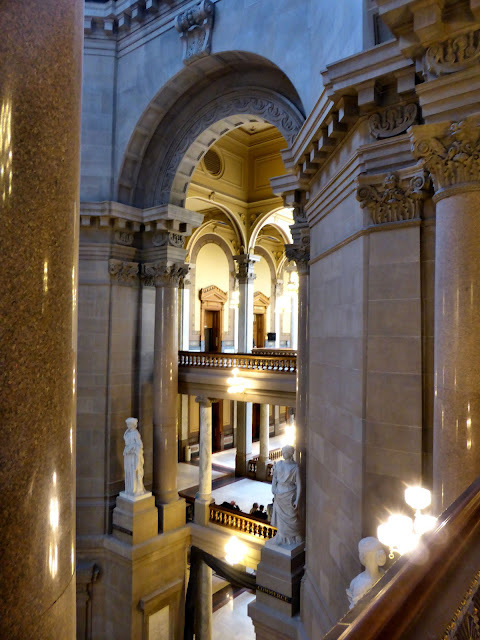 Around the walls, windows offered a view into the chamber from the offices of Senate officials. In general, there was an unexpected lack of ornamentation, but the popcorn style ceiling was the biggest surprise. Before we moved on, we chatted in the hall with the gregarious Carol for another 20 minutes before she pointed us in the direction of the entrance to the House gallery. Rather than a friendly employee at that doorway inviting our visit, we found a walk-through metal detector (because House members don't trust the one at the main entrance?) and a curmudgeonly sentinel who totally ignored us, as if we weren't standing two feet in front of him. Finally we asked him if we could visit the gallery. He raised his eyes and muttered, "Go ahead." 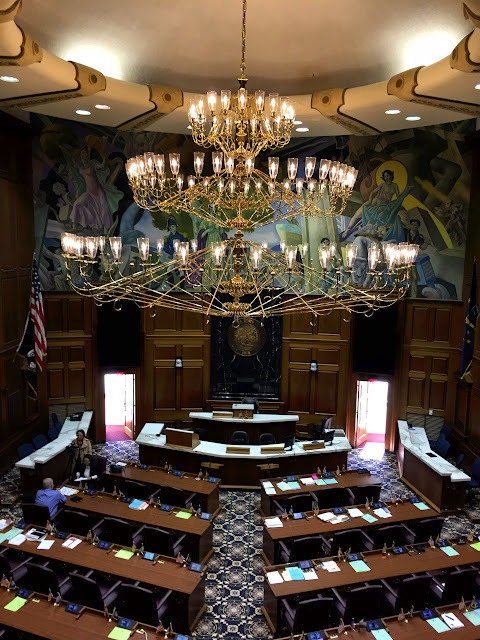 The moment we walked into the House gallery, the view was overwhelmed by a massive 20 ft. x 25 ft. chandelier, which is equipped with 100 bulbs, one for each House member. 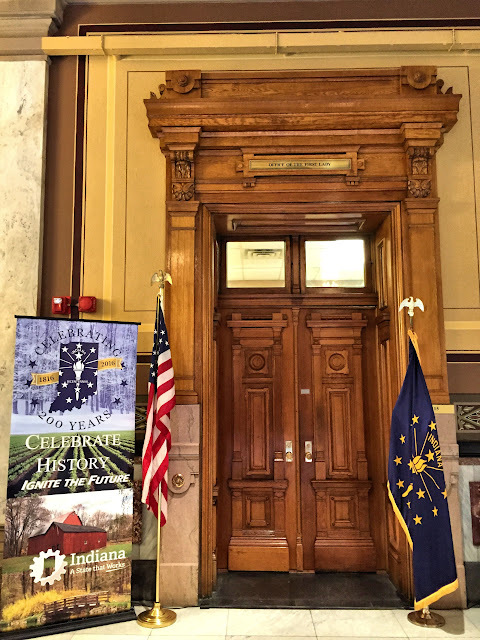 An impressive mural above the Speaker's desk, the "Spirit of Indiana," depicts an allegorical history of the state. In contrast to what we have seen in so many other statehouses, Indiana's House of Representatives chamber was more elegant and ornate than the Senate. Grateful to have discovered this small fourth floor dose of hospitality, we wound up our self-guided tour around 11:30. 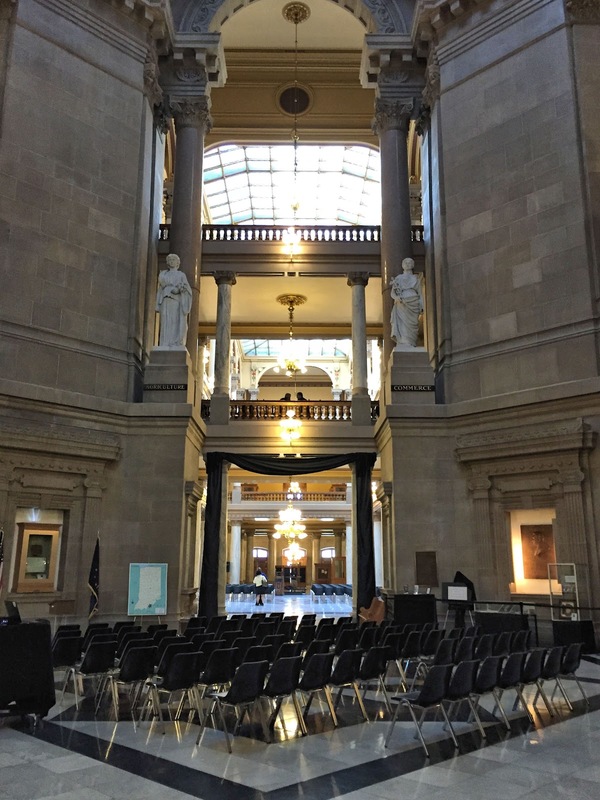 Though the Indiana statehouse has some undeniably attractive design elements that create little vignettes of beauty as you move around the building, the chilly reception from the people in the capitol tarnished the architect's artful conception. 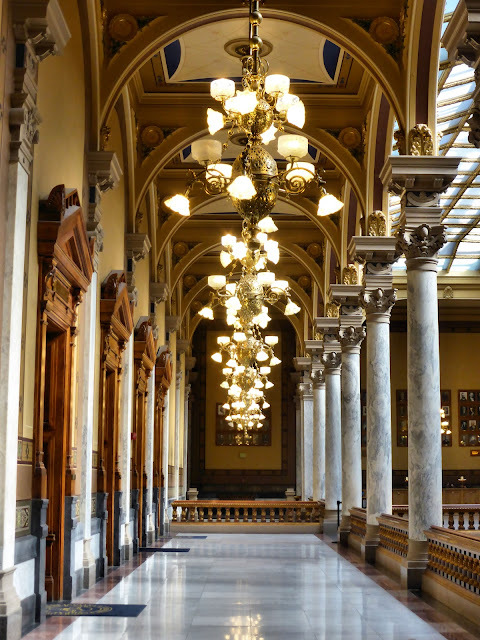 Of the 26 state capitol buildings we have visited, Indiana's rated highest on the unfriendly meter.